Some of the best learning can happen when things don’t work as expected. This year when we took out our hand pump to introduce it to the children, teachers couldn’t get the pump to work. We tried priming, read the manual multiple times, but could not see why the pump didn’t work. After all, there aren’t many moving parts to break on a manual pump like this. When we read some advice about how to take the pump apart to see if anything was blocking the inner works, we decided to include the children in the effort. When children tried the pump and realized there was a problem, many were eager to help solve the problem. This was especially true when they saw a toolbox nearby. After studying the screws together, the children agreed on which two screws we should try to remove first. They helped choose the bit (“there is an “x” shape on the screw – look for a screwdriver end that will fit in an “x”) and together we removed the screws. Then we tried to move the works, but they were still completely stuck. After many trials (and after just about giving up) there was a pop and the moving parts released. We moved the works up and down – and the children thought the problem was solved. The teacher mentioned that sometimes things get stuck in the pump – there are wood chips nearby, sand and stones on the playground. Could something have gotten inside the pump? Children went to work investigating every part. They found that there was a screen on one side filtering out debris – nothing blocking there. They looked down into the water and saw a muddy ring. Could that be sand? Could it move into the pump and block the water? How could we reach it? The search was on for sticks and toys that might be long enough to reach in. Some fit, many were too wide or too short. Whatever we did, the rings remained. The conclusion reached was that those rings could not cause the problem, because we couldn’t get at them. One child thought we should turn the pump upside down so we tried that (though it was tricky to handle all that water). Others thought just try the pump again. Still no luck. By this time, children had been engaged in problem solving for quite a while, and many were ready to give up. Not everyone though! The teacher left the children on their own to help elsewhere on the playground and a few children kept working the pump, trying to prime it, pouring in water in any opening they could find. And the pump started to work! We never figured out why it was blocked and what made it start working again, but now, about a week later, if the water is slow, we see a group of engaged problem solvers rearranging pieces, pouring water, and getting things moving again – no adults needed. A hand pump like this offers terrific opportunities to think about water flow, pipe systems, and how to work together to solve a problem. Children generate questions (how can we get the water to go up through here? Why doesn’t the water go all the way through to the last opening?) and offer solutions based on their experience (If the water starts higher then it flows faster all the way through. If you want water to go through the last opening you have to block the openings that come first. When you pump faster more water comes out.). Just trying out an idea requires teamwork since it’s much easier to pump if someone else is there to stabilize the pump and help direct the water. Many adults think that children this age have short attention spans and are easily discouraged. That’s not the case when there is a strong interest in the materials, activities and resulting problems to solve at hand! When we offer children the kinds of materials that lead to deep investigations, we see persistence and engagement. 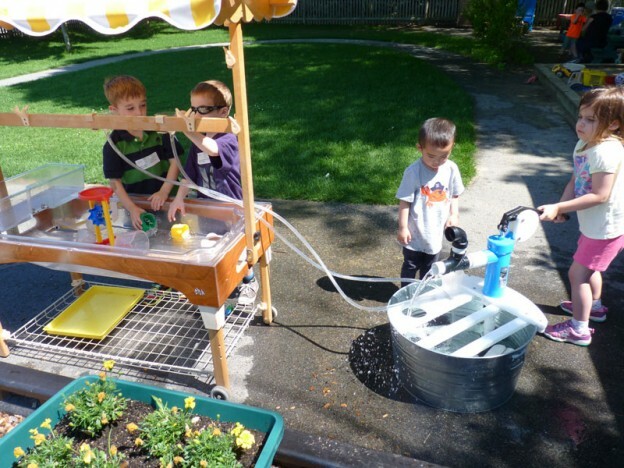 A simple hand pump like this one – too big to work alone – offers endless opportunities for children to explore their world, think together about how things work and explore the properties of natural materials (like water) in their environment. This entry was posted in Uncategorized and tagged curriculum, education, preschool, science on June 23, 2015 by Katrina Selawsky.